There has been a delay—some very substantial—EVERY SINGLE DAY THIS WEEK! I don’t even remember it being THAT bad when they introduced the T to the system. What in Willie Brown’s name is going on?!? Thursday: crash at 18th Ave, watched several packed shuttles, 71s, and 28s go by from 20th Ave before I finally was able to jump on a 28 and catch the L.
Friday: ??? We could be in for a real treat! I’ve been late every single day this week—from anywhere from 15 minutes to almost 1 ½ hours! Thankfully I have an understanding boss, but this has gone from angering to farcical to angering again. Where is the accountability here? Anyway, on to other pressing concerns: you wouldn’t happen to have any N Judah Chronicle/Streets of San Francisco-style shirts left for sale, do you? M or L? I’ve gotten really obsessed with Streets the last six months or so (DVR it on KOFY every day) and would love to get one. It is this kind of day-to-day unreliability that the Mayor, the MTA board (with some exceptions, to be sure) , and Supervisors often seem to be completely out of touch with when they talk all things Muni, particularly when it comes to how to pay for it. The SF Appeal is reporting that more and more cuts and fare increases are coming, but that’s because the Mayor and his MTA board are so barren of ideas, and so timid, they don’t dare consider real ways to pay for things besides more parking tickets and more half-assed revenue sources. Nor do they bother to consider cutting down on absenteeism or knock out some wasteful 100k+ employees to cut pension and wage costs. So long as we have people in there that are completely clueless about what it’s like to have a job where you don’t get paid no matter what, nothing’s going to get better. And when you have idiots like the MTC vote for boondoggles over spending precious federal dollars on something of use to us in day to day life. 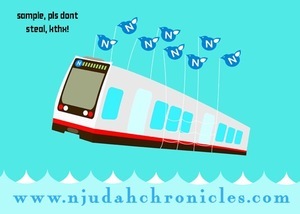 Why not commemorate this week of FAIL with a Muni Fail Whale Shirt, Mug, or Mousepad? From now until Sunday, you can get 15% off using the code ZAZZLEFORYOU at checkout. Bring your mug to work, spike your coffee with the booze or flavored syrup of your choice, and regale your coworkers with tales of fail. This entry was posted in MUNI Day To Day, Reader Mail. Bookmark the permalink. Thanks for posting about the meeting. I have had a crazy 24 hours with Muni. All I wanted was to buy a one day Passport which is economical if you are aren’t a Fast Pass holder and want to ride the cable car a couple times. I wanted to get it in advance so I could just hop on the N this morning. First they sent me to a location that doesn’t carry them anymore, then I tried to go downtown to get one, but got stuck in the metro problems and turned back. Finally got to the Powell and Market kiosk this morning to find that the price went from $11 to $13, but that wasn’t reflected on the website (it is fixed now). And when you call 311 that’s where they get there info. In the long run it would have been cheaper just to pay the $10 for two rides, with the wasted trip yesterday, and the $2 I paid this am. It took so long to get downtown that we only rode out and back on the cable car. Had to laugh this morning when we got on the N shuttle bus. The fare box had smoke coming out of it. The poor operator was exasperated. He had everyone get off for safety, and took a bit of verbal abuse from a passenger. Smoking fare box is a new one on me. It does seem that the shuttle buses are getting out there fast. There was an accident at Sunset & Judah a few days ago, blocking the tracks and a bus came really quickly.